Not one of Greene’s best but certainly a novel that plots his development as a novelist on his way to his later greats. 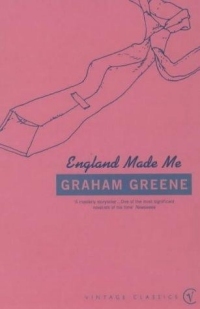 I’ve read a large amount of Greene; he’s one of my favourite authors. This book has some devices he was obviously experimenting with. He tries out a kind of stream-of-consciousness approach in a couple of places and they work. He pushes the point of view around more than I remember in any other novel too and this is okay too. But these do jar a bit with his straightforward descriptive approach from the third person, watching a moral dilemma splinter the life of an otherwise unremarkable individual, the usual style of Greene’s work. So, not a Greene I’d heartily recommend to anyone really but if you are a Greene fan you might find this interesting as a glimpse of him developing his full-blown style. The missal in the cupboard, the Madonna, the spider withering under the glass, a home from home.